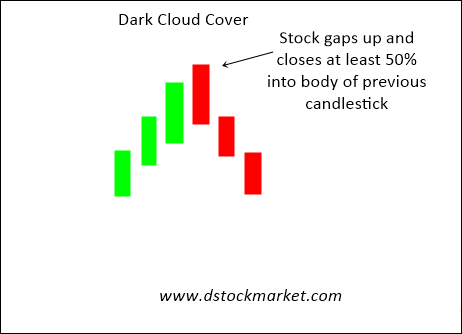 The dark cloud cover candle pattern is a bearish reversal pattern that often appears at the end of an uptrend. It can be very effective in spotting a reversal, the start of a downtrend or a correction. Traders often look for these kind of patterns to spot a top in their stock. Many will take profits when this pattern appear. Some will even short the stock if the dark cloud cover pattern appear at a resistance. 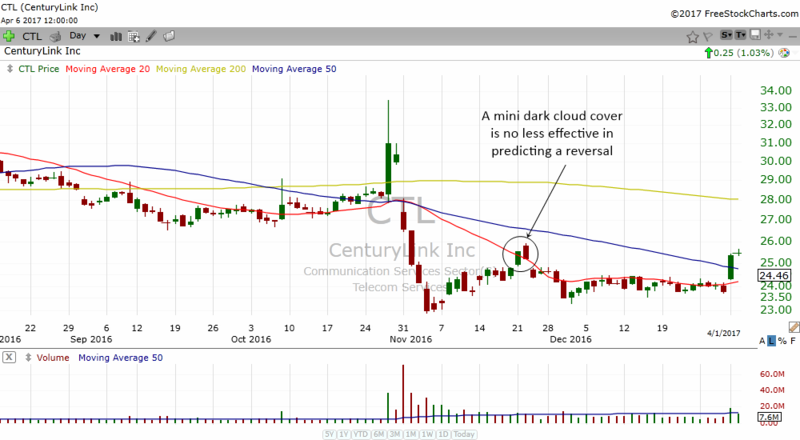 The diagram above shows the construction of the dark cloud cover candlestick pattern. The pattern will usually appear at the end of an uptrend or rally. The sentiment is extremely bullish and at the last day, the stock gapped up powerfully because of the greed of market participants. Then before you know it, the stock moves lower and closes at least 50% into the body of the previous green candle. The red candle does not close below the low of the green candle, otherwise it will be known as another candlestick pattern by the name of bearish engulfing. The psychology behind this pattern is very simple. There was a lot of bullishness in the stock but suddenly the bulls cannot keep control and you see bears creeping in. What was so good suddenly became very bad and as the stock drops below the pattern, it gives traders the confirmation that the bears are taking control of this stock. That's why when a trader sees this pattern being confirmed, he or she will exit the stock and some might even consider shorting this stock. 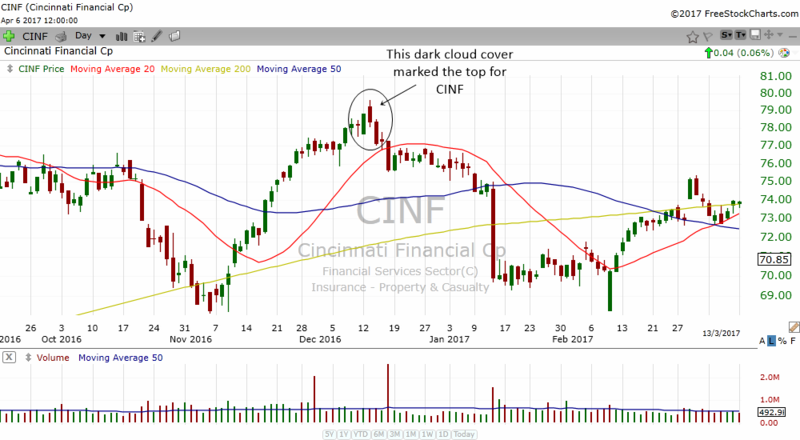 In the chart above, CINF formed a dark cloud cover after a prolonged period of rising stock price. When the stock fell below the pattern, this confirmed the validity of the pattern and marked the short term top for this stock. Look how this stock collapsed. 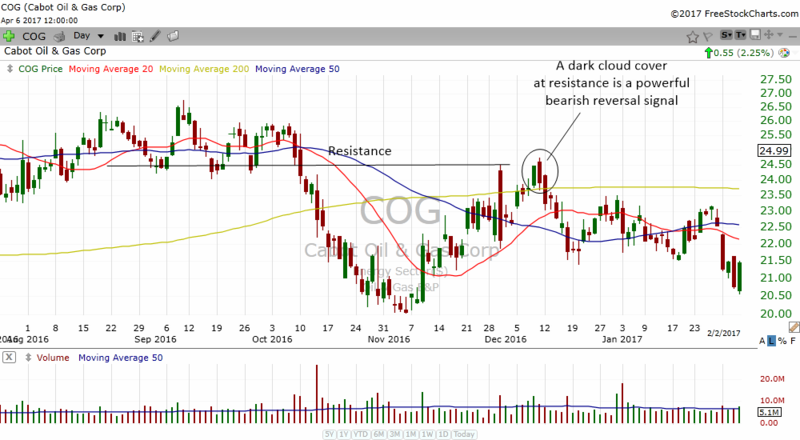 COG in the chart above formed a dark cloud cover pattern at a resistance area. When a bearish reversal candlestick pattern forms at a resistance area, you need to take care and beware. The stock eventually collapsed and the dark cloud cover marked a short term top for this stock. A dark cloud cover that appears in a downtrend rally can often signal another wave of selling. In the chart above, CTL rallied for awhile and then a mini dark cloud cover formed in the stock right at the 20 MA. This gave hints to traders that there might be another wave of selling. The signal was so powerful that the stock gapped down the next day and move lower for the next week. 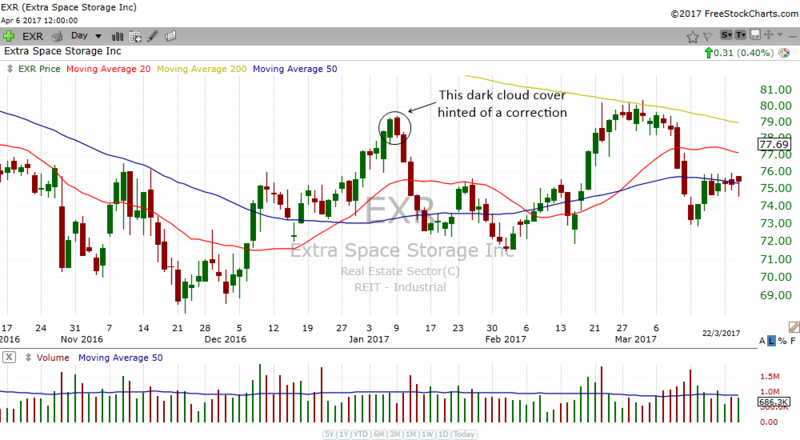 A dark cloud cover appeared in EXR after a short rally. The bearish reversal pattern worked very well in the stock and hinted of a short term top. The stock immediately corrected for the next few days. Sometimes the dark cloud cover pattern can really mark the top of a move very well. 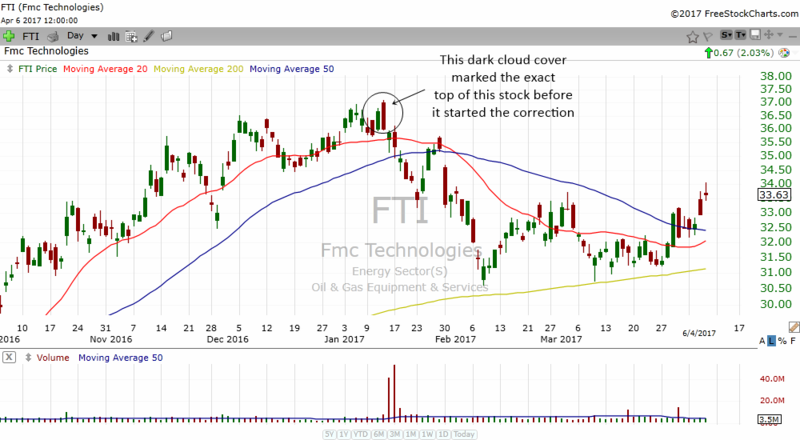 Around January, FTI exhibited a dark cloud cover pattern and the pattern marked the exact top for the stock before the correction kicked in. When you have such a potent reversal pattern that works quite well, it will be foolish for traders to ignore this pattern when it appears in their stock.